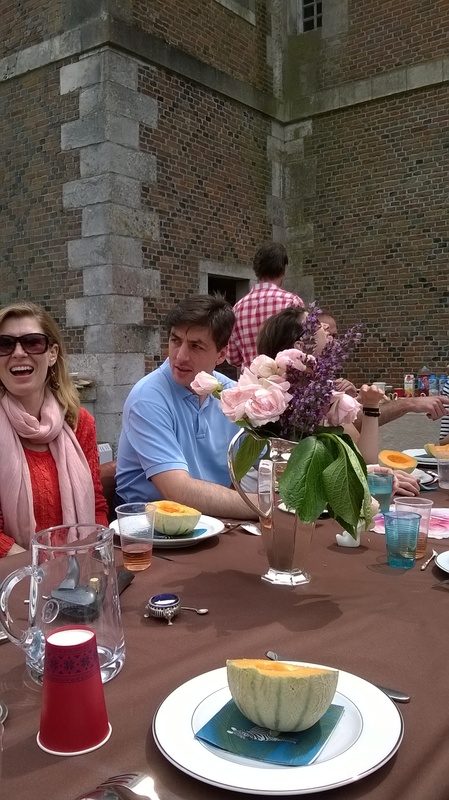 Husband à l’etranger had barely stepped of the plane, nor had a moment to sleep off the ‘decalage horaire’ (jet-lag) before I whisked him off to our lovely friends for an “Apéro Dinatoire” at their mini-chateau. This lovely evening out is a wonderful way to spend time with friends whilst trying a myriad of “amuse bouches”, or canapés acompanied by a glass or two of carefuly selected wines. The idea behind the “apéro dinatoire” is to eat gradually through the evening without ever sitting formally at the dinner table, nor eatening anything that we would generally consider a full blown meal. Nevertheless, by the end of the evening the stomach is pleasantly full and the tastebuds tantalisingly tested! 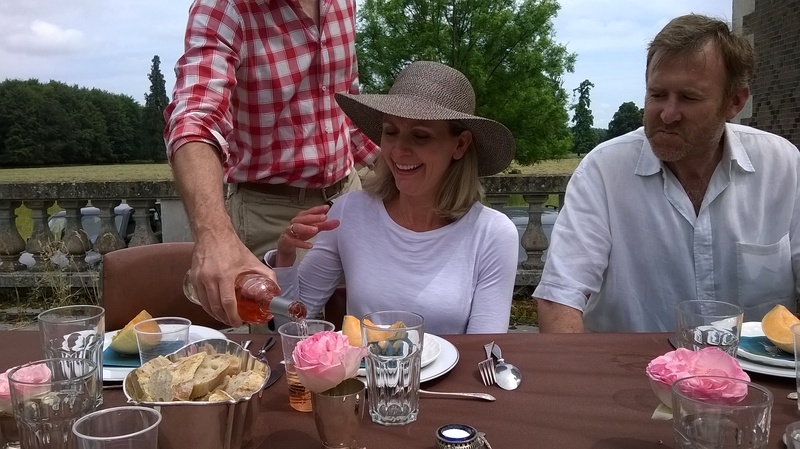 The “apéro”, and the “apéro dinatoire” are very much part of the french culture and way of life, and a seemingly effortless way to entertain without the stress of a sit-down dinner, the former being an invitataion to drinks, whilst the latter, an invitation to stay the whole evening. 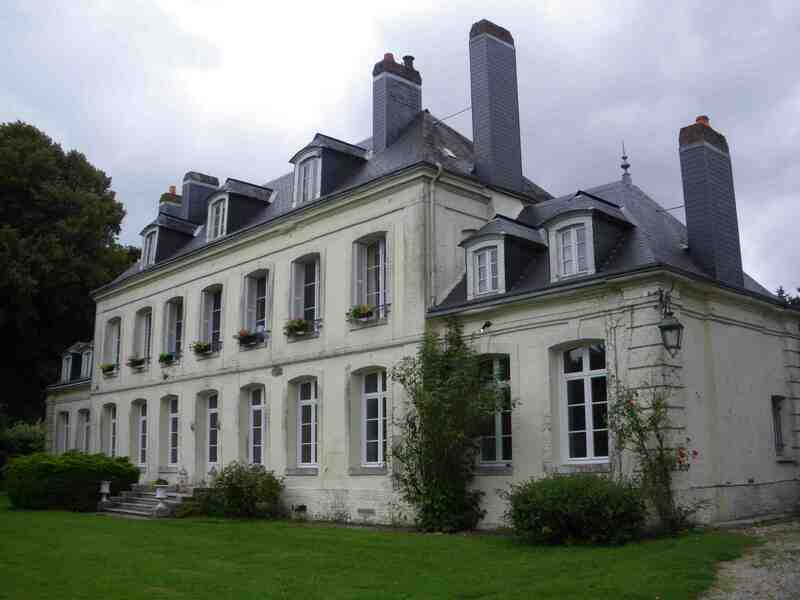 should you dream of owning your own perfect mini-chateau look no further than this one! Somewhere about half-way through the evening one of the gathered company thanked “Husband à l’etranger” for our generous invitation to “picnic at the ruin” the following day, and he acknowleged the event mindful to ask me what I had planned when we got back into the car at the end of the evening. It was only a lot later that he discovered that the ruin was not our own, but one destined to make us feel that ours was merely in need of a quick flick of a paint-brush. There are ruins, and then there are RUINS! Sunday saw us bumping down a pot-holed and grassy track in the balmy sunshine before coming to a halt beside a gathering of scattered cars and knee-high grass. 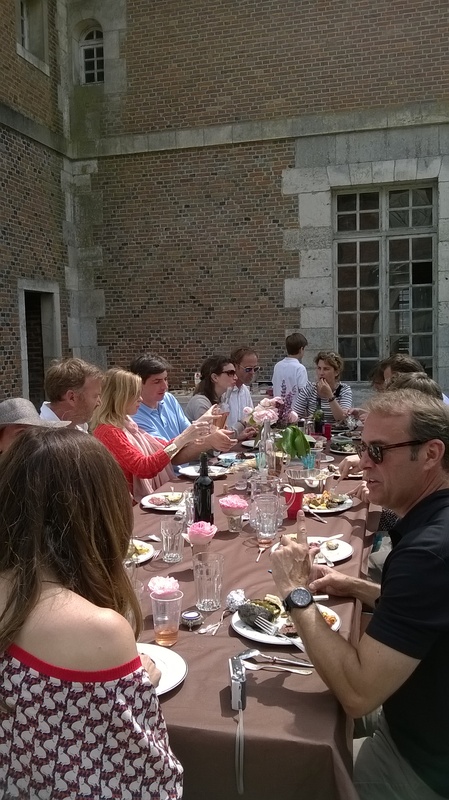 In front of us a beautiful, and down-at-heel chateau and the distinct smell of a wood-fired barbecue. In the distance laughter and shouts from children gone wild, and the distant hubub of adults from somewhere deep in the bowels of the cellars of the house. This is France at its best. For as we penetrated the gloom of the chateau listening for the direction of voices, we stumbled out onto a long terrace where, table cloth billowing in the gentle breeze, a table for twenty lay ready and waiting it’s lunch guests, china, cutlery and silver jugs laden with garden flowers. A little bit of perfection amongst the dust and debris of the chateau itself. Minutes later the party from the night before took to their seats, and from the embers of the woodfire, a “côte de boeuf” (side of beef) and sizzled potatoes, accompanied by a full bodied red. No sooner finished than the best of Normandy, oozing ripe cheeses were passed around the table with hunks of fresh baguette; then as always in a typical french meal, the salad with a rich nutty dressing; followed by two gorgeous patisseries, the Framboisier, fresh raspberries engulfed in rich crème patissière and light gateau, and a chocolat moelleux, a gooey molten-centred chocolate cake. Words cannot describe the camaraderie of the afternoon, nor the romance of the setting. 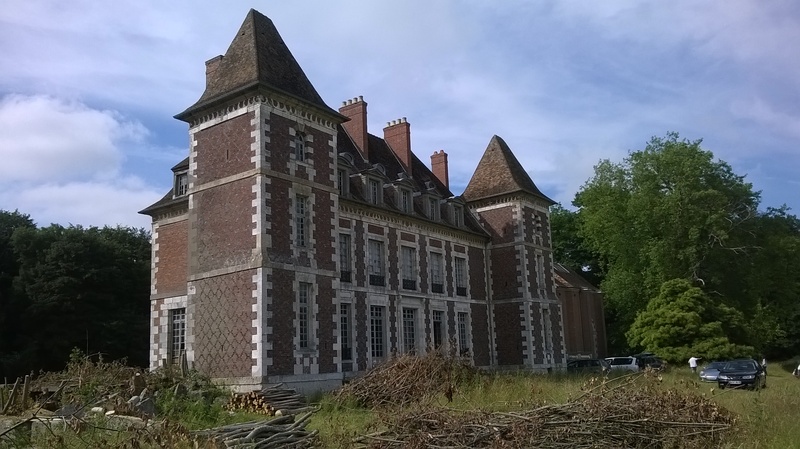 A chateau commandeered during the second world war and left ravaged and pillaged over the subsequent years, only to be bought back by its rightful owners several generations later with dreams to restore it to its former glory. No running water nor electricity, and much immagination needed when it came to bathrooms! As dusk began to fall, the china, and glasses were stacked into the boots of many cars, as tired, happy, and ever so slightly dusty the friends parted company and made their way home again. 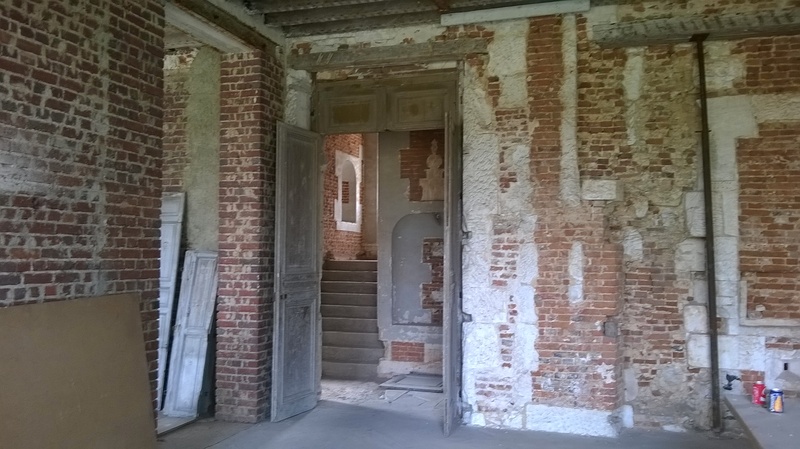 This entry was posted in Chateau, Eating out, French House Renovation and tagged Apéro dinatoire, barbecue, chateau, France, Normandy, picnic, ruin, Summer, Sunday by frenchimmersion. Bookmark the permalink. Yes, somehow we know that France will always offer moments like this, and it is part of the fairytale magic that draws so many of us to her. Thank you for capturing that for us.